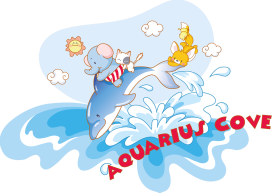 Birthdays are more fun at Aquarius Cove! Take advantage of the fabulous indoor space to throw a memorable party for your child. Have the whole venue to yourself by booking our FULL BUFFET parties with full buffet set up, banquet tables & chairs. Call us at 9006 4533 to get to know more about our delectable menus. For smaller parties, do take a look at our Aquarius Fun Party Package, Fantastic Birthday Bash or Super-licious Theme Party Package. Looking for a fuss free party? This is a free and easy package for families looking for a cosy setting for your kid's party! Snacks and drinks for children and accompanying adults are available, do check with Torrance @ 90064533 for menu and rates. Strictly no outside food & drinks / catering allowed. ** Subject to availability, priority given to parties with buffet catering. # Not valid on eve of public holiday, public holidays & school holidays. This package is packed with loads of fun, food and laughter. Snacks and drinks for accompanying adults are available, do check with Torrance @ 9006 4533 for menu and rates. - All the items in Funtastic Birthday Bash Party Package but with your choice of a popular character theme. - All decorations and party ware will be based on the theme. - The birthday child will also receive a balloon bouquet based on the chosen theme. - A non-refundable/ transferable deposit of 50% payable upon booking. - Party date reserved without deposit payment can only be held for a maximum of 10 days. - Party balance to be paid immediately after the party. - The total number of children attending must be confirmed with us at least 1 week in advance. - We politely request that guests do not arrive until allocated party time. - Unlimited free play applies only if there is no private party after your party slot. - Parents must ensure there is adequate supervision for children. - Cost of package includes one free accompanying adult per child. Any additional adult thereafter would be chargeable at $5 per pax. - If a party that exceeds 40 pax, there would be a need to book the playground exclusively whereby the entire playground will be closed off for the exclusive party. FOR PARTY ENQUIRIES, KINDLY CONTACT TORRANCE AT 9006 4533.